Well, to put it simply, the reconciliation can be attained in three 3 simple steps: Identify Mismatches, Review the same and Communicate with your vendors for rectification!! Let us assume, a consignment was procured under the invoice number ‘AST-1202’ with a billing amount of Rs. 110.86. The consignment was recorded by the supplier in his GSTR 1 i.e. Sales Return in Feb 2018. The goods were delivered at your warehouse in Maharashtra (which is the place of supply) in Mar 2018 and you claimed ITC in Mar 2018. However as the dispatch of goods was from Karnataka, he mentioned the place of supply as Karnataka with Invoice Value of 111 in GSTR1. To begin your venture into the world of a hassle-free reconciliation, the very first step is to identify the discrepancies occurring in your records and your suppliers’ sales data. Let’s analyse the above-mentioned scenario to identify possible discrepancies. An error is made while preparing the GSTR1 by the supplier and there is a wrong invoice number submitted: Accidentally filing invoice number as AST-1220 instead of AST-1202. The data is filed in a mismatching format such as skipping hyphen i.e. AST 1220 instead of AST-1202. Month of booking of an invoice by supplier can be different than the booking of same purchase invoice by you. For example, supplier could have filed the invoice in Jan 2018 month’s GSTR 1 whereas you could have booked the same and claimed your ITC in March 2018 month. Finally, when all your data match, the last step is to ensure that the total number of inward invoices at your end match with the total number of invoices by the supplier. For instance, your record tallies to 134 invoices, however, the data reflected on form GSTR 2A shows 150 invoices. Ensure no data was omitted, duplicated, or erred while recording the same in your accounts books. If you find any error, you can rectify the same while filing the subsequent GSTR 3B. To reject the invoice and ask for a amendment of invoice from the supplier. Make sure all the credit notes made against the return of goods were also recorded in your ledger. Make sure there was no duplication or skipped invoice in your records. You are susceptible to discrepancy even if your ITC claim is higher than the amount reflected through form GSTR 2A. Nevertheless, you can file for reversal of ITC in GSTR 3B, in your subsequent filing. The final stage in reconciliation is to communicate with your suppliers for all the discrepancies and ask for edits/changes if any. And as per the communication, you can accept the changes reflected in GSTR 2A (if the mismatch has been identified on your end) or reject the changes and let your supplier rectify the given mismatch. However, going by the organizational structures and number of inward supplies, manually tracing the discrepancy across multiple invoices and further rectifying it with your vendors (probably spread across the country) can be a tedious task. So is there any better way to process your reconciliation without any hassle? 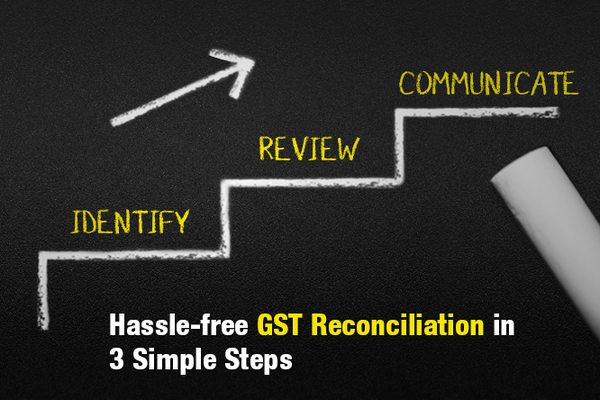 Yes, courtesy to IRIS Sapphire, the preferred GST solution of top organizations across the country, reconciliation can be easier than you think. Built-in with advanced algorithm and fuzzy logic, IRIS Sapphire helps you reconcile all your data, with no-hassles guaranteed. It swiftly scans through your purchase and the suppliers’ sales data and points out the discrepancies. Furthermore, its smart assistance can help you to rectify the discrepancies (if any), on the go.